New Delhi: The sun sinks low over what used to be the flood plain of the Yamuna in east Delhi, bathing the half-built pink sandstone and steel edifices of the Commonwealth Games Village in its glow. Hundreds of labourers are streaming out after the day shift: work is progressing at a frenetic pace to meet the sporting event’s October deadline. 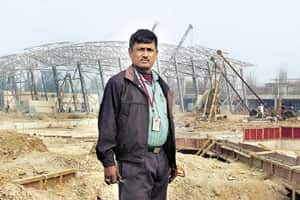 As the Delhi Metro Rail Corp.’s gleaming new trains glide smoothly overhead, Rudra Kakoti joins a group of people waylaying the workers emerging from the complex located just across the sprawling Akshardham temple complex. They attempt to strike up conversations with the workers, splitting up into groups to avoid attracting attention of the guards and peppering the workers with questions: Are you getting paid the minimum wage? Are the payments made on time? What about crèche facilities and drinking water? And finally, would you like to become a member of the union? Trade unions have been struggling for decades to organize labourers who work outside the formal economy and make up at least 90% of India’s 450-million plus workforce. The key challenge—they go where the work takes them, which means such workers are constantly on the move. Kakoti works for the Mahanagar Asangthit Mazdoor Union (MAMU), one of the half a dozen local trade unions that have sprung up in the capital city in the past one decade. The group is affiliated to the Congress party’s Indian National Trade Union Congress. Kakoti’s colleagues at the Village gate belong to various other groups such as the Delhi Asangthit Mazdoor Union and the Nirman Mazdoor Panchayat Sangam (NMPS)—all of which claim to have 7,000-10,000 members each—and focus on workers at construction sites. Most of these are poor migrants who arrive in search of jobs in a city witnessing the biggest development boom since the 1982 Asian Games. The unions, which compete with each other for membership (for a fee of Rs70-180 a year), joined forces after a three-day strike in December last year at the Village site after a labourer fell off the scaffolding. That agitation, for better safety measures, resulted in the administration—already jittery about completion deadlines—putting all the Commonwealth Games related infrastructure projects out of bounds to the unions. Kumar arrived at the Village last month soon after finishing jobs at an educational institution in Ambala, Punjab, and a site in Himachal Pradesh. As the son of construction workers, Kumar said he’s been at building sites ever since he can remember, ruling out any possibility of formal schooling. He began by helping his landless parents, contributing to the family income and moving with them when ever they went to destinations arranged by contractors, who arrived at their village in Uttar Pradesh’s Gorakhpur district from time to time. Kumar said he arrived in Delhi after he negotiated with his contractor to raise his wages to Rs200 a day, or Rs42 more than the state’s current skilled wage rate, from Rs168. “The contractor said he will pay more, so I came." 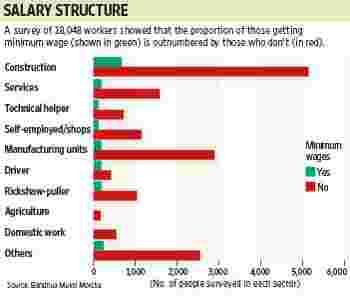 But a majority of construction labourers earn less than the stipulated minimum, according to a study by Bandhua Mukti Morcha (BMM). A 2007 survey of 18,048 workers showed that only 10% of the labourers earn the minimum wage in the Delhi region. The “violation of minimum (wage standards) is just not rampant here, but across the country," said Swami Agnivesh, BMM’s founder, whose efforts are focused on freeing bonded labour. What makes things difficult is that workers at the Games sites change every two months, which means that labour laws can’t be applied. With frequent rotation, workers’ problems don’t become immediately obvious unless there are major accidents. Since labourers are not provided any kind of work experience certificate, those who have worked for a decade do not always get the wages that skilled workers are entitled to. Delhi has three separate wage slabs for unskilled, semi-skilled and skilled workers, ranging from Rs152-168 a day. At least four dozen workers went on strike over non-payment of wages in March, according to a Mint story that appeared earlier this year. The report says Ahluwalia Contracts (India) Ltd, the main contractor at the site, had not been able to pay them because Emaar MGF was defaulting on payments. The number of workers had dropped from 7,000-8,000 to 2,000-2,500 as they weren’t getting paid, the report said, citing a company official. Emaar declined to comment but an official from Ahluwalia Contracts, who did not want to be identified, said the firm has set up a safety committee at the games site, without elaborating. “We try to provide all facilities to our labourers," the person said. India’s economy is driven by the informal sector, contributing 45% of the country’s output, data from the ministry of micro, small and medium enterprises show. Half of India’s national income—about Rs37,490 per capita—is contributed by this sector, says the National Commission for Enterprises in the Unorganized Sector (NCEUS), a body that was set up by the ministry. Experts and trade unions say workers do not have protection against dismissals, accidents or pension. While unorganized workers create value, the government is not serious about protecting their rights, said Tapan Sen, secretary of the Communist Party of India (Marxist)-affiliated Centre for Indian Trade Union. “Workers are most likely to be thrown out of their jobs if they raise demands or make attempts to organize a union," he said. While workers have little scope for collective bargaining, the problem goes beyond wages and benefits. In recent months, accidents at work sites such as those of the Delhi Metro and the Commonwealth Games Village have come into sharp focus as different government agencies contradict and undercount death statistics. According to the Delhi government, just two people have died in construction accidents between 2002 and 2008. However, a Right to Information application filed with the police by a member of the Nirman Asangthit Mazdoor Union (NAMU), a local trade union affiliated to the New Trade Union Initiative, said death counts of officially reported cases are 261 while 491 others have suffered grave injuries. In July, Gammon India Ltd was banned from taking government projects for a period of two years, after half a dozen workers died in an accident in south Delhi. Delhi Metro Rail Corp. Ltd (DMRC) started formal proceedings to blacklist Gammon India, which maintained that it was the design plan submitted by Arch Consultants Ltd that was at faul. Delhi Metro is examining Gammon’s reply to the show-cause notice, said Anuj Dayal, DMRC’s spokesperson. Arch Consultants has already been removed from metro projects since the accidents, he said. To address the welfare issues of the mobile working population, the state government has set up a special board for building and construction workers. The board, which has built up a corpus of Rs300 crore since being set up in 2002, has offered help to a handful of workers. Active members on the rolls have fallen from 17,000 to 1,500, workers who contribute the mandatory fee of Rs20 every month. It rarely meets, and lately, has become the prime target of critics amid allegations of financial assistance being extended to NGOs run by board members themselves. No one has been able to pin down a close estimate of how many construction workers actually live and work in Delhi, which labour secretary K.S. Wahi said is part of the problem. But the guess is anywhere between 400,000 and 1 million. Workers are often given loans by contractors to entice them to come and work at the sites. Brothers Mukesh and Gopal Choubey came from West Bengal’s Murshidabad district after the contractor agreed to pay Rs3,000 as an advance. The wives, Gopal said, meet daily household expenses by rolling beedis at Rs60 for 1,000 pieces. While the brothers are on a 52-day contract and earn Rs125 a day, meals are taken care of by the contractor. “Whatever we earn becomes extra income for the family," Gopal said. The unions say they should be allowed to enter the sites and organize the workers to make them aware of their rights. The government seems apathetic to the cause, the unions say. “Many workers go back home without getting their full dues. Many don’t know how to go about filing a case even when they want to," said Binod Singh, project coordinator of NMPS. “Unless trade unions are allowed to enter and monitor, nothing’s going to change."